What files need to be deployed from the development environment to the production environment depends in part on whether the ASP.NET application was built using the Web Site Model or Web Application Model. Learn more about these two project models and how the project model affects deployment. In general, all client-side support files should be copied from the development environment to the production environment, but what server-side support files get copied depends on whether you are explicitly compiling the server-side code into an assembly (a .dll file) or if you are having these assemblies auto-generated. This tutorial highlights what files need to be deployed when explicitly compiling the code into an assembly versus having this compilation step occur automatically. ASP.NET web pages are divided into declarative markup and source code. The declarative markup portion includes HTML, Web controls, and databinding syntax; the code portion contains event handlers written in Visual Basic or C# code. The markup and code portions are typically separated into different files: WebPage.aspx contains the declarative markup while WebPage.aspx.vb houses the code. In order for the ASP.NET engine to service a request for this page, the page's code portion (the WebPage.aspx.vb file) must first be compiled. This compilation can happen explicitly or automatically. If the compilation happens explicitly then the entire application's source code is compiled into one or more assemblies (.dll files) located in the application's Bin directory. If the compilation happens automatically then the resulting auto-generated assembly is, by default, placed in the Temporary ASP.NET Files folder, which can be found at %WINDOWS%\Microsoft.NET\Framework\<version>, although this location is configurable via the <compilation> element in Web.config. With explicit compilation you must take some action to compile the ASP.NET application's code into an assembly, and this step occurs prior to deployment. With automatic compilation the compilation process occurs on the web server when the resource is first accessed. Regardless of what compilation model you use, the markup portion of all ASP.NET pages (the WebPage.aspx files) need to be copied to the production environment. With explicit compilation you need to copy up the assemblies in the Bin folder, but you do not need to copy up the ASP.NET pages' code portions (the WebPage.aspx.vb files). With automatic compilation you need to copy up the code portion files so that the code is present and can be compiled automatically when the page is visited. The markup portion of each ASP.NET web page includes a @Page directive with attributes that indicate whether the page's associated code was already explicitly compiled or whether it needs to be automatically compiled. As a result, the production environment can work with either compilation model seamlessly and you do not need to apply any special configuration settings to indicate that explicit or automatic compilation is used. Deploy Assemblies in Bin Directory? Table 1: What files you deploy depends on the compilation model used. The files that makeup the project are defined in a single project file. Any files not defined in the project file are not considered part of the web application by Visual Studio. Uses explicit compilation. Building the project compiles the code files within the project into a single assembly that is placed in the Bin folder. Rather than having a single project file that spells out the project's files, the file system is used instead. In short, any files within the web application folder (or subfolders) are considered part of the project. Building a project in Visual Studio does not create an assembly in the Bin directory. Instead, building a Web Site Project reports any compile-time errors. Support for automatic compilation. Web Site Projects are typically deployed by copying the markup and source code to the production environment, although the code can be precompiled (explicit compilation). Microsoft revived the Web Application Project model when it released Visual Studio 2005 Service Pack 1. However, Visual Web Developer continued to only support the Web Site Project model. The good news is that this limitation was dropped with Visual Web Developer 2008 Service Pack 1. Today you can create ASP.NET applications in Visual Studio (and Visual Web Developer) using either the Web Application Project model or the Web Site Project model. Both models have their pros and cons. Refer to Introduction to Web Application Projects: Comparing Web Site Projects and Web Application Projects for a comparison of the two models and to help decide what project model works best for your situation. Web.config, the application's configuration file. ~/Default.aspx - the site's homepage. ~/About.aspx - an "About the Site" page. ~/Fiction/Default.aspx - a page listing the fiction books that have been reviewed. ~/Fiction/Blaze.aspx - a review of the Richard Bachman novel Blaze. ~/Tech/Default.aspx - a page listing the technology books that have been reviewed. ~/Tech/CYOW.aspx - a review of Create Your Own Website. 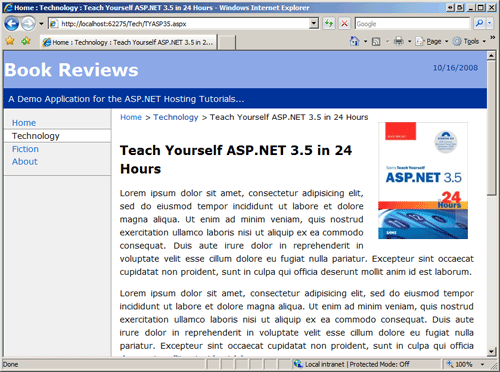 ~/Tech/TYASP35.aspx - a review of Teach Yourself ASP.NET 3.5 in 24 Hours. Three different CSS files in the Styles folder. Four image files - a Powered by ASP.NET logo and images of the covers of the three reviewed books - all located in the Images folder. A Web.sitemap file, which defines the site map and is used to display menus in the Default.aspx pages in the root directory and Fiction and Tech folders. A class file named BasePage.vb that defines a base Page class. This class extends the functionality of the Page class by automatically setting the Title property based on the page's position in the site map. In a nutshell, any ASP.NET code-behind class that extends BasePage (instead of System.Web.UI.Page) will have its title set to a value depending on its position in the site map. For instance, when viewing the ~/Tech/CYOW.aspx page, the title is set to "Home : Technology : Create Your Own Website". Figure 1 shows a screen shot of the Book Reviews website when viewed through a browser. 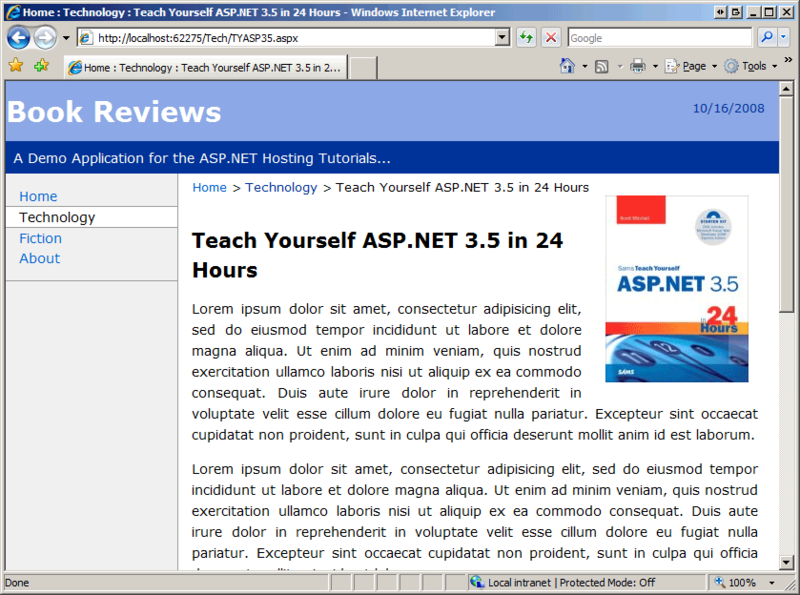 Here you see the page ~/Tech/TYASP35.aspx, which reviews the book Teach Yourself ASP.NET 3.5 in 24 Hours. The breadcrumb that spans the top of the page and the menu in the left column are based on the site map structure defined in Web.sitemap. The image in the right upper corner is one of the book cover images located in the Images folder. The website's look and feel are defined via cascading style sheet rules spelled out by the CSS files in the Styles folder, while the overarching page layout is defined in the master page, Site.master. This application does not use a database; each review is implemented as a separate web page in the application. This tutorial (and the next several tutorials) walk through deploying a web application that does not have a database. However, in a future tutorial we will enhance this application to store reviews, reader comments, and other information within a database, and will explore what steps need to be performed to correctly deploy a data-driven web application. These tutorials focus on hosting ASP.NET applications with a web host provider and do not explore ancillary topics like ASP.NET's site map system or using a base Page class. For more information on these technologies, and for more background on other topics covered throughout the tutorial, refer to the Further Reading section at the end of each tutorial. This tutorial's download has two copies of the web application, each implemented as a different Visual Studio project type: BookReviewsWAP, a Web Application Project, and BookReviewsWSP, a Web Site Project. Both projects were created with Visual Web Developer 2008 SP1 and use ASP.NET 3.5 SP1. To work with these projects start by unzipping the contents to your Desktop. To open the Web Application Project (BookReviewsWAP), navigate to the BookReviewsWAP folder and double-click the Solution file, BookReviewsWAP.sln. To open the Web Site Project (BookReviewsWSP), launch Visual Studio and then, from the File menu, choose the Open Web Site option, browse to the BookReviewsWSP folder on your Desktop, and click OK. The remaining two sections in this tutorial look at what files you will need to copy to the production environment when deploying the application. The next two tutorials - Deploying Your Site Using FTP and Deploying Your Site Using Visual Studio - show different ways to copy these files to a web host provider. The Web Application Project model uses explicit compilation - the project's source code is compiled into a single assembly each time you build the application. This compilation includes the ASP.NET pages' code-behind files (~/Default.aspx.vb, ~/About.aspx.vb, and so on), as well as the BasePage.vb class. The resulting assembly is named BookReviewsWAP.dll and is located in the application's Bin directory. Figure 2 shows the files that make up the Book Reviews Web Application Project. As Figure 2 shows, the ASP.NET pages' code-behind files are not displayed in the Solution Explorer for a Visual Basic Web Application Project. To view the code-behind class for a page, right-click on the page in Solution Explorer and choose View Code. The files that contain the declarative markup for every ASP.NET page, such as ~/Default.aspx, ~/About.aspx, and so on. Also, copy up the declarative markup for any master pages and User Controls. The assemblies (.dll files) in the Bin folder. You do not need to copy the program database files (.pdb) or any XML files you may find in the Bin directory. You do not need to copy the ASP.NET pages' source code files to the production environment, nor do you need to copy the BasePage.vb class file. As Figure 2 shows, the BasePage class is implemented as a class file in the project, placed in folder named HelperClasses. When the project is compiled the code in the BasePage.vb file is compiled along with the ASP.NET pages' code-behind classes into the single assembly, BookReviewsWAP.dll. ASP.NET has a special folder named App_Code that is designed to hold class files for Web Site Projects. The code in the App_Code folder is automatically compiled and therefore should not be used with Web Application Projects. Instead, you should place your application's class files in a normal folder named HelperClasses, or Classes, or something similar. Alternatively, you can place class files in a separate Class Library project. In addition to copying the ASP.NET-related markup files and the assembly in the Bin folder, you also need to copy the client-side support files - the images and CSS files - as well as the other server-side support files, Web.config and Web.sitemap. These client- and server-side support files need to be copied to the production environment regardless of whether you use explicit or automatic compilation. The Web Site Project model supports automatic compilation, a feature not available when using the Web Application Project model. With explicit compilation you must compile your project's source code into an assembly and copy that assembly to the production environment. On the other hand, with automatic compilation you simply copy the source code to the production environment and it is compiled by the runtime on demand as needed. The Build menu option in Visual Studio is present in both Web Application Projects and Web Site Projects. Building a Web Application Projects compiles the project's source code into a single assembly located in the Bin directory; building a Web Site Project checks for any compile-time errors, but does not create any assemblies. To deploy an ASP.NET application developed using the Web Site Project model all you need to do is copy the appropriate files to the production environment, but I would encourage you to first build the project to ensure that there are no compile-time errors. Figure 3 shows the files that make up the Book Reviews Web Site Project. Deploying a Web Site Project involves copying all of the ASP.NET-related files to the production environment - that includes the markup pages for ASP.NET pages, master pages, and User Controls, along with their code files. You also need to copy up any class files, such as BasePage.vb. Note that the BasePage.vb file is located in the App_Code folder, which is a special ASP.NET folder used in Web Site Projects for class files. The special folder needs to be created on production, as well, as the class files in the App_Code folder on the development environment must be copied to the App_Code folder on production. In addition to copying the ASP.NET markup and source code files, you also need to copy the client-side support files - the images and CSS files - as well as the other server-side support files, Web.config and Web.sitemap. Web Site Projects can also use explicit compilation. A future tutorial will examine how to explicitly compile a Web Site Project. Deploying an ASP.NET application entails copying the necessary files from the development environment to the production environment. The precise set of files that need to be synced depends on whether the ASP.NET application's code is explicitly or automatically compiled. The compilation strategy employed is influenced by whether Visual Studio is configured to manage the ASP.NET application using the Web Application Project model or the Web Site Project model. The Web Application Project model uses explicit compilation and compiles the project's code into a single assembly in the Bin folder. When deploying the application, the markup portion of the ASP.NET pages and the contents of the Bin folder must be pushed up to the production environment; the source code in the application - the code files and code-behind classes, for example - do not need to be copied to the production environment. The Web Site Project model uses automatic compilation by default, although it is possible to explicitly compile a Web Site Project, as we will see in future tutorials. Deploying an ASP.NET application that uses automatic compilation requires that the markup portion and source code must be copied to the production environment. The code is automatically compiled on the production environment when it is requested for the first time. Now that we have examined what files need to be synced between the development and production environments we are ready to deploy the Book Reviews application to a web host provider. Visual Studio 2005's Web Site Project System: What Is It and Why Did We Do It?